Just like “Ease PDF to Text Extractor”, a freeware which helps you to pull out text from PDF documents, PDF to Word Doc Converter is one more such tool which has ability to convert a PDF file into a Word document. Though it is possible to copy the contents of a PDF file and paste it into a word document without using such tools, the original pattern of the file is not retained. 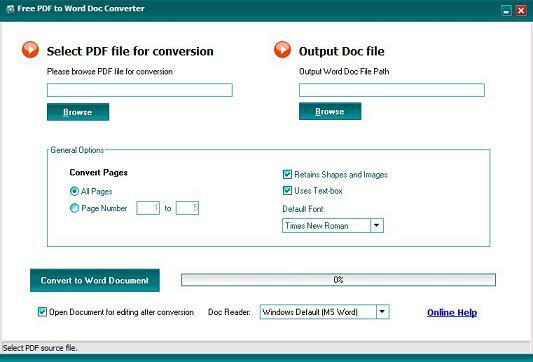 PDF to Word Doc Converter is a free utility which efficiently converts all the data in the PDF file to a word file without altering the images and shapes present in the original document. You need to just download this free tool and install it. Once the installation process is over, simply launch the converter and browse to locate the PDF file that you wish to convert. Also browse the output document file path to select the desired path at which you need the output word document to be saved. The converter also offers a few general options which you can configure. You may choose to convert the whole PDF file or select only a few pages. The general options allow you to retain images and shapes, preserve the original character spacing and use formatted text to reclaim page layout. However, if you just need the text, you may uncheck these options so as to save memory space. The only drawback with this utility is that it can convert only a single PDF file to a Word file at a time and is unable to convert files in bulk. PDF to Word Doc Converter is just 1.07MB in size and therefore does not consume much of the memory space. It can be downloaded free of charge from hellopdf website.